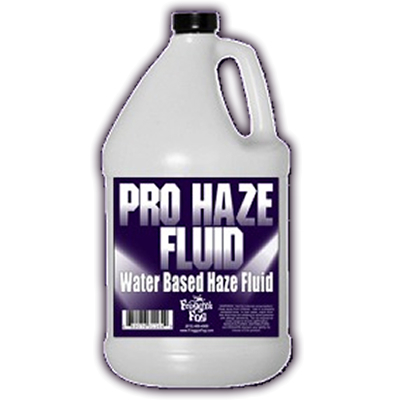 Froggys Pro Haze Fluid is a water based haze juice designed to generate an excellent haze through any facility or venue for defining light beams and other specialty effects. It is a perfectly composed haze liquid that produces a pure, translucent haze with a long hang time and low moisture content. Compatible with virtually all water based haze machines. Froggys Pro Haze Fluid is practically odorless, and when used properly will produce the perfect effect for your lighting needs. It is made from the highest quality pharmaceutical grade chemicals and with the amazing results you will see from this fluid, it makes Froggys Pro Haze Fluid the perfect alternative to high priced retail hazer fluids. All Froggys Fog and Haze Fluids are made from lab-grade UV-Filtered de-ionized water and pharmaceutical grade chemicals, each approved by the FDA. Haze is a thin mist effect that adds atmosphere and dimension to any performance area. Its primary use is for lighting effect enhancement. Haze is also perfect for creating a spooky atmosphere in Halloween haunted houses. Hazers have become especially popular with the advent of intelligent moving light effects and are now used throughout the entertainment industry as much as, if not more than, traditional fog machines. Froggys Haze Fluid is made from pharmaceutical grade chemicals, each approved by the FDA. Check out our awesome ratings and customer satisfaction as well as our testimonials section. Highly recommended for facilities that do not allow heavy fog usage during indoor events.